It’s a time-honored truth. Grandma’s recipes are the best! The food was most likely made-from-scratch, fresh, and warm from the kitchen. These muffins are straight from Nana’s stained and yellowed recipe card – you remember those days when recipes were written on 3 x 5 index cards, don’t you? 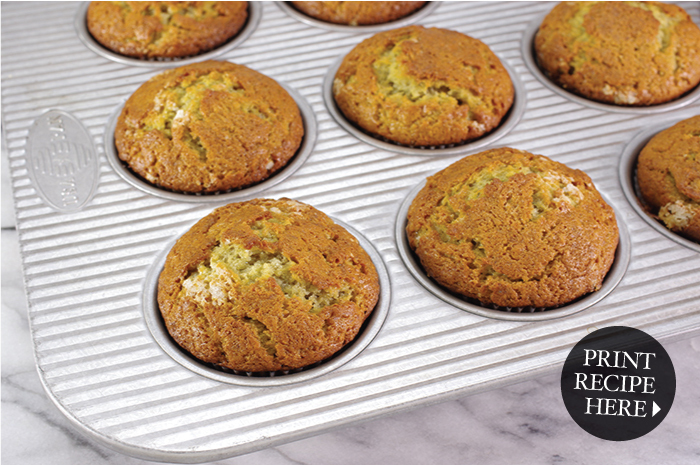 It’s a simple recipe that returns a moist, very dense muffin full of real banana flavor. The top and sides of the muffins slightly caramelize to form a pleasant sweet crust. Beware, they are addictive! 1. Preheat the oven to 400°F. 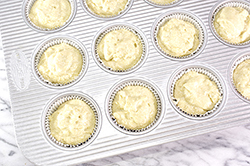 Prepare baking pans by greasing the interior sides of the baking pans, or positioning baking cup liners in each well. 2. 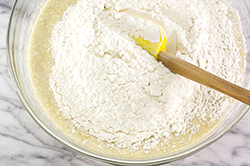 In a large bowl, mix the flour, baking soda, and salt together whisking well so that the baking soda and salt are evenly distributed throughout the flour. 3. 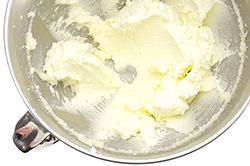 With a hand or stand mixer, cream the butter and sugar together in a large bowl. Beat for 3 minutes until the mixture becomes a little fluffy and slightly lighter in color. 4. In a separate bowl, mash very ripe bananas with a fork or potato masher until fairly smooth. If the bananas are not very ripe, nor easily mashed, puree with a food mill, handheld blender, or food processor. 5. Add the sour cream to the mashed bananas, and mix until smooth and uniform. 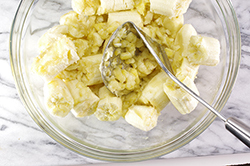 The sour cream will help keep the bananas from overbrowning during the mixing process. 6. 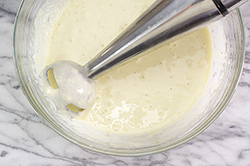 With a whisk, break the eggs and beat slightly until uniform, but not foamy. Add to the banana-sour cream mixture, and stir. Add to the bowl with the blended butter and sugar, and beat until combined. 7. 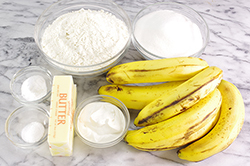 Combine wet and dry ingredients by adding the flour to the banana mixture. With broad strokes, fold the two together gently until uniformly mixed; do not over mix. 8. Spoon the batter into the prepared baking cups. The batter will be thick. Fill the pans about three-quarters full; this will be dense, moist muffin. 9. Bake in the preheated 400°F oven for 16-18 minutes or until a fingertip touch on the top of a muffin bounces back, or when a toothpick inserted into the center of a muffin comes out clean or with only moist crumbs. Do not over bake. 9. Allow the muffins to cool slightly in the pan, then remove and place the muffins on a cooling rack to complete the cooling process. Serve warm or cool.